Call or Email Us for Quantity Discounts! Our most popular powder-free, textured examination glove, the Diamond Grip glove stands alone. The Diamond Grip glove is tough and reliable, yet is also exceptionally comfortable. 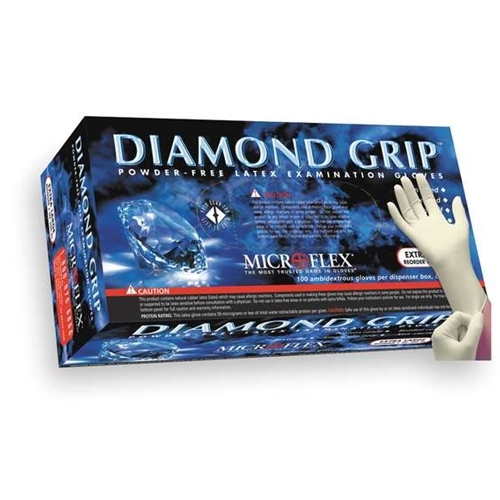 Diamond Grip exam gloves feature a micro-contoured fit to reduce hand fatigue. Sensimax fingertips provide superior sensitivity and tactile feel. The patented Diamond Grip texture helps ensure that hands will not slip, even in the most adverse conditions. Made of low modulus natural latex. Non-sterile and ambidextrous. CAUTION: This product contains natural rubber latex (latex) which may cause allergic reactions. Safe use of this glove by or on latex sensitized individuals has not been established.